This is a recipe my husband snagged from Paula Deen when he was looking for something different to carry to the once-a-month breakfast our Sunday school department holds. Everyone brings a dish, we eat, visit, and have our Sunday School lesson together rather than breaking up into various groups. I cooked this dish for the first time earlier this month when my husband and I hosted a group of teenagers from our church for a DNow weekend. There was just a small section of the casserole left as the girls headed off to worship at a nearby church and complete a service project. Serve the casserole with some sausage links or patties on the side. Slice French bread into 20 slices, 1-inch each. Arrange slices in a generously buttered 9 by 13-inch flat baking dish in 2 rows, overlapping the slices. In a large bowl, combine the eggs, half-and-half, milk, sugar, vanilla, cinnamon, nutmeg, and salt and beat with a rotary beater or whisk until well blended but not too bubbly. Pour mixture over the bread slices, making sure all are covered evenly with the mik-egg mixture. Spoon some of the mixture in between the slices. Cover with foil and refrigerate overnight. The next day, preheat the oven to 350 degrees. 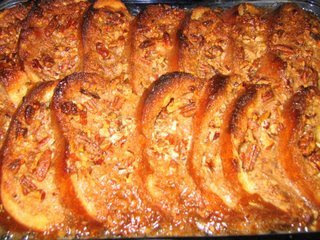 Spread Praline Topping over the bread and bake for 40 minutes, until puffed and lightly golden. Serve with maple syrup.